Rosa Regs was born in Barcelona, where she obtained a philosophy degree from the university. She founded and directed the publishing houses La Gaya Ciencia and Bausán, as well is the magazines Arquitectura Bis and Cuadernos de la Gaya Ciencia. She worked as an editor and translator for the United Nations in Geneva, New York, Nairobi, Washington and Paris. Between 1994 and 1998 she directed the Ateneo Americano of the Casa de América in Madrid. She was awarded the Creu de Sant Jordi (Cross of Saint George) of the Generalitat (autonomous government) of Catalonia and the Legion of Honor of the French Republic. She is the author of the novels Memorias de Almator, Azul (Blue, Premio Nadal award, 1994), Luna Lunera (Premio Ciutat de Barcelona award, 1999), La canción de Dorotea (Premio Planeta 2001) as well as the short-story collections Pobre corazón, Viento armado and Desde el mar. She has also written about cities and travels in Ginebra (about Geneva), Viaje a la Luz del Cham (about Syria) and Volcanes dormidos (written with Pedro Molina Temboury, about Central America, Prix Iberia 2003). Collections of her articles and family experiences have appeared under the titles Canciones de amor y de batalal (1997), Más canciones (2000), Sangre de mi sangre (1998) and Diario de una abuela de verano ( 2003). Blue is the story of an intense relationship between Andrea, a married woman journalist with a complicated social life; and a younger man, Martín Ures, who has come to Barcelona from the interior of Spain and discovers a diverse world of people and work, and above all the quality of love that, alchemy-like, turns into something so very mutable and so definitively dangerous. During a brief stopover on a desolate Greek island Martín discovers (paying the price of his discovery) the corrosive power of moral manipulation and the shattering violence of omission. 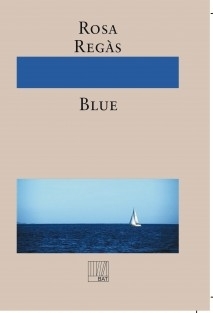 With her precisely chiseled, lyrical style and a dazzling efficiency in analysing feelings and situations, Rosa Regs unfolds a description of how this voyage becomes an exploration of his private hell along the Intensely blue path of the sea and the night. Azul won the Premio Nadal award in 1994.